Chrissy Lim is no stranger to starting and steering quality businesses. She is the founder of Paperplane, a visual storytelling studio, and her trail of remarkable projects includes Quickcut and Kitchenomics. In this interview, Chrissy looks back on her business journey and shares an honest perspective on what it takes to strike out and wander into business for the first time. What would you say to fresh grads who feel conflicted between getting a job and starting their own business? When we speak to people who are fresh grads, I’m like: “Definitely give it a go.” As a 20-year old, you can live on “ramen profitability”– when a company makes just enough money to keep all the founders eating ramen. But as you get older, your tastes evolve and it’s harder to rough it out. You want to eat at nice restaurants, you get married, you have kids, and your responsibilities make it much harder (but not impossible). So to fresh grads: give it a go. You really have nothing to lose except your own time, and you’ve got plenty of time, right? How about those branching into business later down the road? The maturity that comes from experience always helps. Working within a team structure, starting out at the bottom and working your way up… all of that builds character and a solid knowledge base. Paperplane would probably not be where it is without the skills and connections I nurtured in advertising over fifteen years. Saying all that, if you start a business straight out of school and it fails, that’s great experience in itself. Failing is the ultimate character and experience builder. Fail up, as they say. What should a young professional consider before quitting their job? And they wander out to start-up on their own, and they find making money is a lot harder than it seems. What’s fun is getting the product out there: but if you want to monetise, you need to do all the mechanical, detailed minutiae that you didn’t want to do in your old job. Hard work is unavoidable, I’m afraid! What are some cautions to note in starting a business? When we were first started, we were like: “I wanna start something!”, “I wanna start something too!”, “Let’s start something together!” Throw in newbie delusions of grandeur: “Oh my God! Our product is so amazing, we’re gonna make millions!” and you’re on a fast-track to a reality check. Starting is easy, sustaining is hard. How should one approach the ruthless vagaries of the market? For me personally it’s been a humbling journey. The marketplace is not within your control, but your product and service is. Having a growth mindset and being open to change, being passionate without being overly attached, making mistakes and growing from them. Most of all, accepting that it’s not all going to happen NOW and managing those expectations. You have to understand the whole journey: it’s not a sprint, it’s a long-distance thing. How exactly does one survive the “long-distance” of business? With stamina, a plan and a support system (allies, mentors, peers). If you want to build a business, it’s not just about putting a product out there— anyone can do that. You need to build an audience and nurture that product. And then you need to continue to innovate and stay ahead of the game, you can’t stay still. At every failure ask “what did I learn?” and ask the same question with every success. What do you consider the best and worst part of running a business? For me, the best part is doing the work. Getting into the flow. I LIVE for the flow. It’s the best drug out there. For me, the flow is a bonfire. The work is the days, weeks, sometimes months of trying to kindle that fire. Every day you show up and you rub those sticks together. You try different types of sticks, different types of kindle. You try flint, you try matches. You throw everything you’ve got into it. Every day, you go to bed exhausted and discouraged because you just couldn’t get that damned fire to start. But every morning, you wake up and think “this is THE day” and you start the process all over again. That is the work. The faith is knowing that the fire is going to start and it will, as long as you keep showing up. When you get that fire started….wow. It’s beautiful. Divine. You’re in the flow and time stands still. Every key stroke, every pixel nudge is inspired by some kind of supernatural genius. Now, you go to bed at night filled with the deepest sense of satisfaction and fulfilment. Your mind is buzzing with more ideas, more fuel. Your bones vibrate with inspiration and a sense of purpose. That’s your reward for the work. It doesn’t matter if it’s a script, or a piece of art or if you’re writing code – the privilege, the honour and the freedom of being able to do the work, your work, is absolutely the best part of running a business. The worst part? Everything else because it takes you away from The Work. Administration. Planning. Marketing. Resourcing. Pitching. I completely fully subscribe to the theory that every successful business needs to have a hacker, a hustler, and a hippie. The hustling is the hardest part for me. Thank you, Chrissy, for this candid contemplation on what it takes to run a startup and for highlighting the relentless spirit of perseverance that is necessary for enduring the long and winding quest. 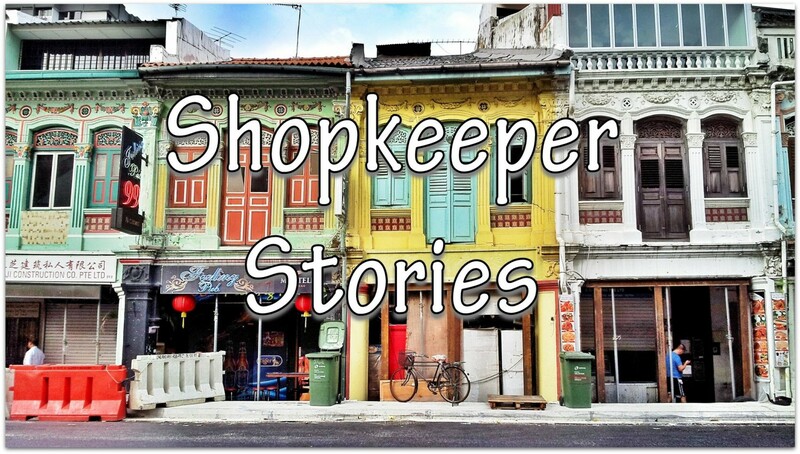 Shopkeeper Stories is a photographic documentary of small business owners and their trades around the world, sharing their views on business and life. You can connect with the community on Facebook and Instagram @ShopkeeperStories. Enjoy! This entry was posted in Singapore, Startups and tagged business tips, design, entrepreneur, hacker, hustler, interview, sleep, startup, storybooks, storytelling, success. Bookmark the permalink.